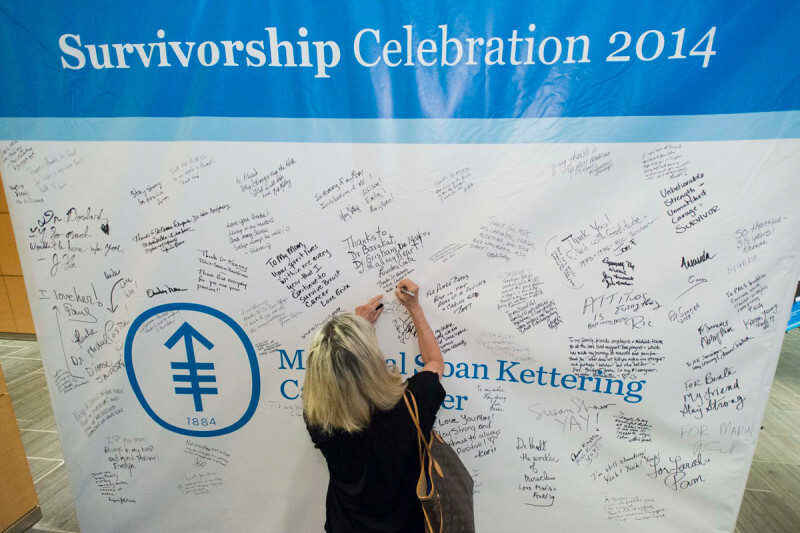 Survivors and family members at our Manhattan event signed their names on a wall and wrote messages to staff and other patients. Olympic gymnast Shannon Miller was diagnosed with germ cell ovarian cancer, a very rare disease, in 2011 and treated at Memorial Sloan Kettering. Learn more about her inspiring story. 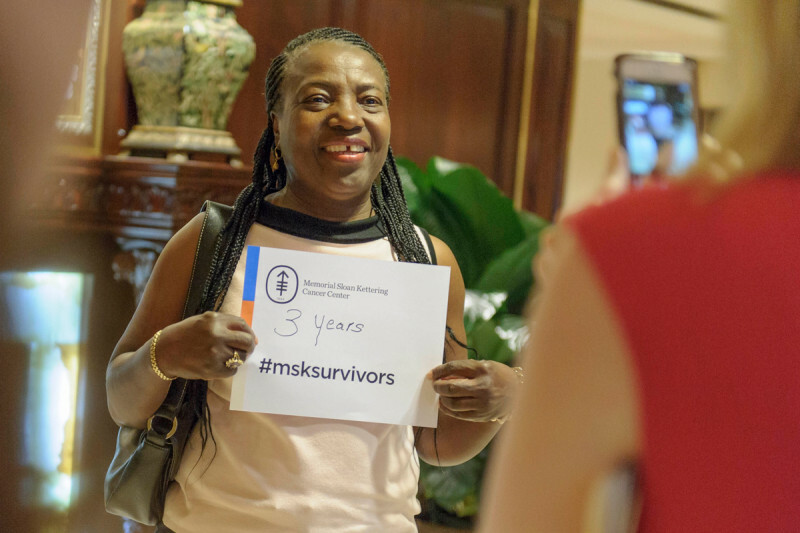 Though National Cancer Survivors Day is traditionally observed on the first Sunday in June, Memorial Sloan Kettering holds celebrations throughout the month for people who have survived cancer diagnosis and treatment, including at our outpatient facilities in Westchester and New Jersey and on Long Island. Shannon Miller — Olympic gold medalist, ovarian cancer survivor, and mom — delivered the keynote speech at our Manhattan survivorship celebration. 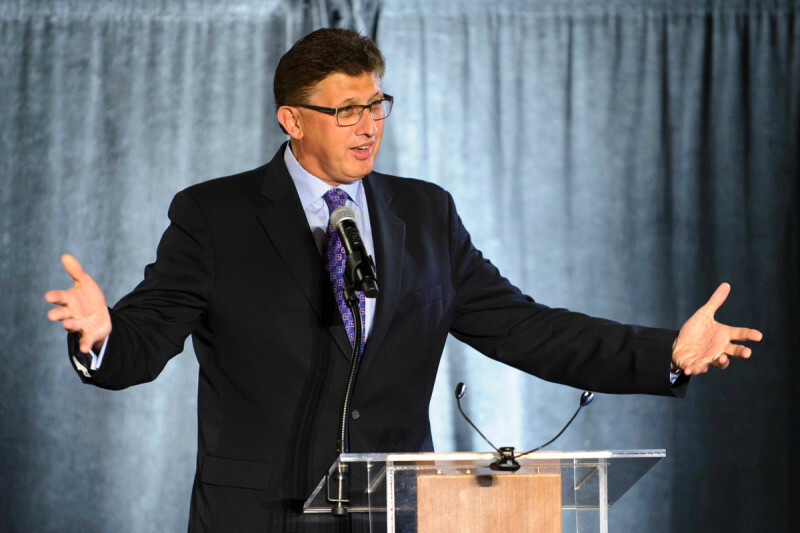 The Manhattan program featured former Olympic gold medalist and cancer survivor Shannon Miller as the keynote speaker. Ms. Miller, who helped carry the US gymnastics team to the gold medal in the 1996 Olympics in Atlanta, was diagnosed with germ cell ovarian cancer, a very rare disease, in 2011. She was treated successfully and soon after gave birth to her second child. Ms. Miller recalled falling down in her first event while trying to qualify for the Olympic team but then rallying a bit later to perform one of the best routines of her life. “The saying in gymnastics was always, ‘You can’t fall and win.’ But what I learned from my career was that when you fall, you get back up,” she said. Gynecological surgeon Richard Barakat delivers his keynote address to attendees at our Long Island event. 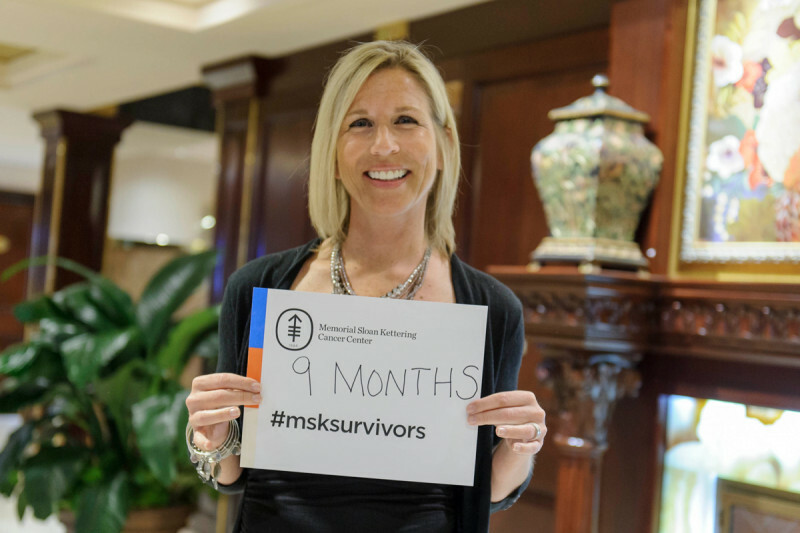 MSK survivor Anita displays her survivorship milestone at our Long Island celebration. 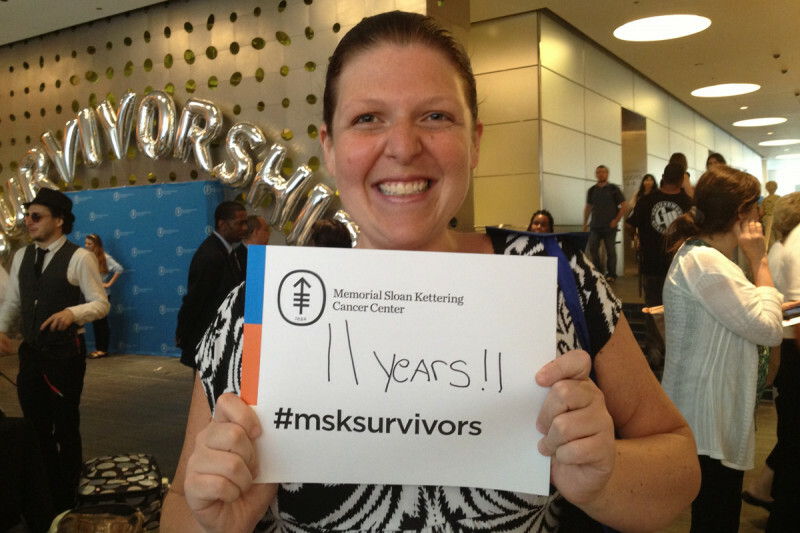 MSK survivor Valia shares her survivorship milestone at our Long Island celebration. Patient speakers Cory Christensen (left) and Mary Elizabeth Williams strike a pose before our event in Basking Ridge, New Jersey. 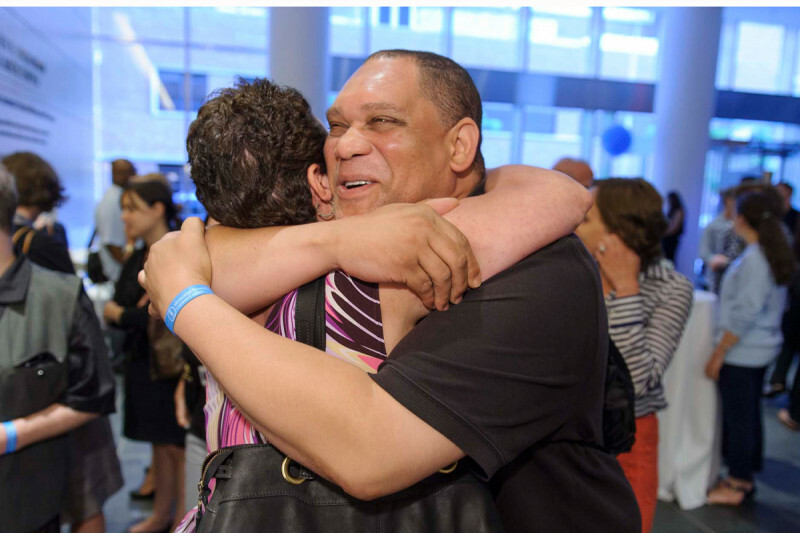 Nick Medley, a cancer survivor and concierge at MSK’s 53rd Street facility, greets a friend during a reception at our Manhattan event. Master of ceremonies Philip Caron and keynote speaker Kelley Hebert pause for a photo at our celebration in Sleepy Hollow, New York. Lauren Peyton, celebrating at our Manhattan event, was a pediatric cancer patient, an experience that made her want to become a nurse. 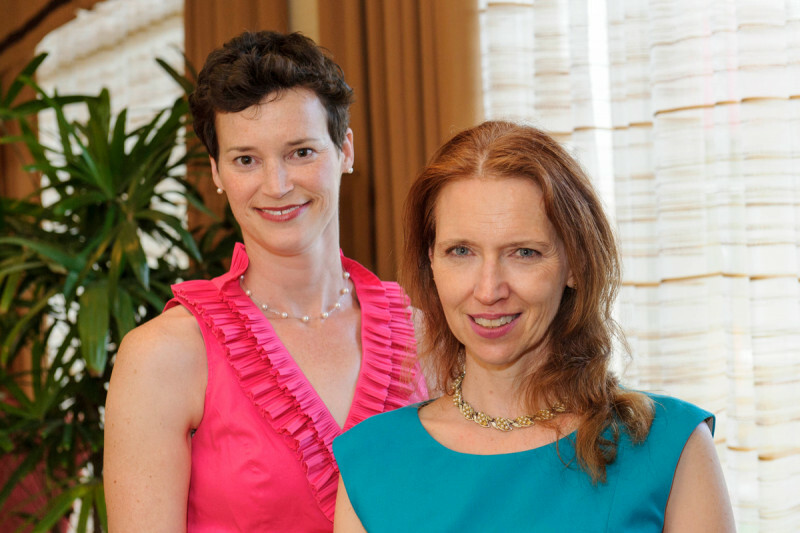 She now works at Memorial Sloan Kettering as a breast cancer chemotherapy nurse. Denise Bing, a research study assistant in Memorial Sloan Kettering’s Department of Urology, recounted her battle with ovarian cancer after she was diagnosed in 2009. 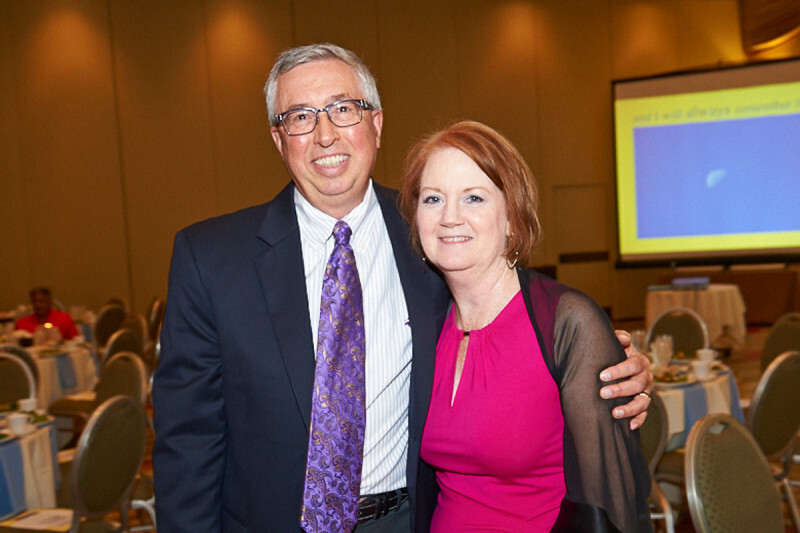 She said after being a caregiver for many others over the years, it was nice to have the help of family and friends as well as the chance to take advantage of the many support programs offered by Memorial Sloan Kettering. She now advocates for patients to use those same programs and to take care of themselves with a healthy lifestyle and frequent checkups. I am awaiting biopsy results here in New Jersey. I want to come there for a surgical consult for breast cancer. Monica, if you are interested in a surgical consult, please call our Physician Referral Service at 646-497-9064 or go to http://www.mskcc.org/cancer-care/appointment. Thanks for your comment. I am an ovarian cancer survivor. I had a hysterectomy in February 2009 & part of my liver removed in September 2009. I am good now. But I was misdiagnosed at a hospital ER & told I had a virus. When my doctor's officer got the report from the hospital they called me right away & my surgery was less than 1 month alter. Thank you for sharing your story, Mary Ann. We’re glad to hear you’re doing well now. I was diagnosed w germ cell ovarian cancer (dysgerminoma)in Aug 17, 2017. Had surgery Aug 20, 2017. Started Chemotherapy Oct 9th and my last treatment was Jan 2nd. I found out Feb 8th that i had no evidence of disease. I beat Cancer.